as one who attended art college, colour is important to me whether i want it to be or not. i'm also fortunate enough to have a modicum of colour invade my day to day, whether through assimilating pixels in photoshop or figuring out which ones to use in web coding. it's a subject that is, or has become eminently more complex than it at first seems, particularly if involved in any pre-press activities. digital devices view everything in red, green and blue, while that destined for print confusingly inhabits a different colour space altogether. you'll perhaps have come across this when printing out photos from your all singing, all dancing inkjet printer, wondering why on earth the colour seems less vibrant than it did when seen on the computer monitor. this isn't a pre-press column, so i'll spare you the pantone process colours, and making a body-swerve from the world of digital capture and display, day to day in the world of reality depends frequently upon colour differentiation to make it from morning till night. and to be quite honest, that selfsame world of colour has an even greater job to do when darkness falls. at its most basic, having a red light at the rear of a bicycle not only alerts following cyclists or motorists to your existence, but through socialisation and education, informs that this is a bicycle not travelling towards but in the same direction. what doesn't really come under the heading of colour or even visibility perception are the all but standard colours used and abused by a disturbing number of cycling apparel manufacturers. i can accept the arguments against producing jackets in unvarying shades of black, for it would seem logical that black outerwear in the darkness of night flies in the face of logic. however, strategic use of reflective panels and piping can often mitigate this apparent cognition problem, perhaps even more so than the all but ubiquitous fluoro yellow. it bears querying why car manufacturers are not as soundly beaten up over painting cars in black. what cannot be denied is the necessity for some degree of visibility not only during dark evenings, but even in the light of day, when all around is fast moving confusion. as the number of vehicles on the road becomes greater by the day, and trucks and buses fail to diminish in size, there is more that requires concentration, thus anything that raises the profile of a lone cyclist is to be roundly applauded. that is perhaps the construct behind the commonality of red, yellow and blue; however, the ubiquity of the latter three could lead to uniformity in the eyes of the motorist, neutralising that which it was designed to counter. the chaps at hultra have taken the racy approach, combining visibility with go-faster stripes while maintaining a sense of speed. earlier this year i reviewed the less than snappily monikered d211 short sleeve jersey, the first offering from a new company on the block. 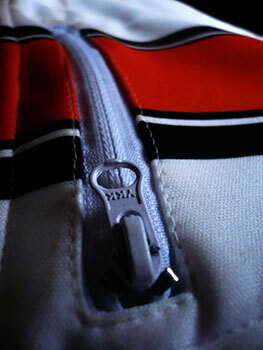 though the colours decorating the jersey are just short of fluorescent, they are bright enough to need a volume control. the new softshell ventoux currently inherits only the orange from the jersey range but continues hultra's raison d'etre with admirable fortitude. there's no way you can be ignored while dressed in this. 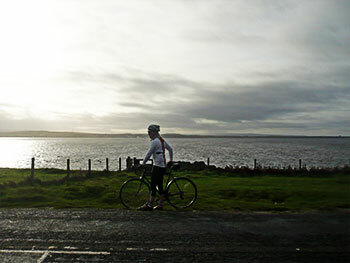 i cannot deny that a high degree of visibility is not at the forefront of cycling life on islay. even with an influx of summer visitors, traffic never quite reaches epidemic proportions; if i'm completely honest, cycling a bicycle on the island is enough to draw attention in the first place. however, none of that detracts from the need for quality cycle clothing, perhaps even more so than in the great metrolops, because in the rural idyll there is often nowhere to hide when the heavens open or the north wind blows. personal protection has a different meaning. i was arrogant enough to ask hultra to send a medium, the same size of jersey i have worn since fausto coppi were a nipper; the fit is indeed, absolutely ginger peachy, but if you have wobbly bits where wobbly bits should not be, you would probably be better to heed their advice and nip up to the next size, for there is minimal stretch in the fabric. the full length zip would surely benefit from a so-called zip garage not only to prevent nipping the skin, but to prevent any accusations of chafing while riding on the drops. i wore a merino collar underneath. the neck however, is commendably high, keeping draughts at bay, and even in medium size, the arm length is excellent: orange cuffs are good in my opinion. 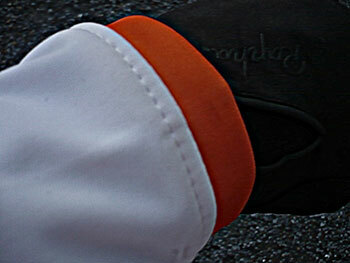 though the orange striping is neither reflective nor fluorescent, night time visibility is taken care of by reflective piping on the ventoux's back and front. though minimal and neatly incorporated into the fabric of the jersey, it is remarkably effective in use, even managing to effuse a blinding glare in direct sunlight. job done. in my review of the hultra jersey, i moaned about the height of the rear pockets, something i found made it awkward to place and retrieve the assortment of paraphernalia one finds it necessary to place and retrieve during a bicycle ride. sadly, the pockets on the ventoux are no different. don't get me wrong, the depth of the main three would carry more than a small van, but the softshell material has little in the way of give which, combined with the height across the back makes life just a bit harder than it needs to be. either that or i need to stick in at my yoga exercises. it is gratifying to note, however, that the centre pocket has a zipped fourth sitting outboard; a mandatory fitting atmo. the hard part is deciding just what the ventoux softshell is, and what it isn't. on a cold morning i'd habitually pop an outer jacket over a long-sleeve jersey, but a fleece-lined, windproof top surely doesn't need such safeguarding? in the interests of satisfying myself and reader, the softshell was paired with a long-sleeve merino baselayer and the great outdoors embraced with gusto, only to find myself perilously close to overheating. it's as well that the front zip is so simple to raise and lower from the saddle. as a winter jacket that promotes an incredible lightness of being on at least two levels, it proved itself hard to beat. 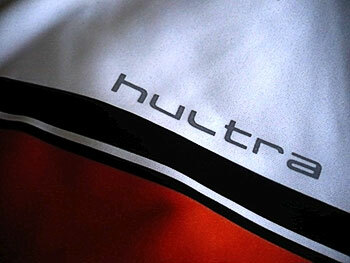 hultra promote the jersey as being of a water-resistant persuasion, and though you may find it hard to believe, i've had little opportunity to verify this claim. there have been a couple of days of torrential rain when it would have been grossly unfair to wear anything less than a deep sea diving suit, but the intervening days were bereft of anything other than a few splashy puddles. those few puddles did, however. 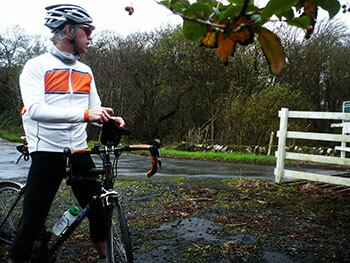 highlight a shortcoming of using large areas of white in a cycle jersey/jacket; white, mudguards or not, has a magnetic attraction for muddy water. that is, however, a trivial complaint when the jacket's modus operandi is to make you stand out in a crowd, something it does with sporting aplomb. with a price tag of only £69.95, assuming you too are of race fit and have no regularly pressing need to fill and empty those rear pockets, adding one or two to your cycling wardrobe shouldn't involve too much endless discussion with yourself.